We will walk through how to set up and use the Post Idea Widget. To use the Post Idea widget, you'll need to be on a plan which includes product management. "Post Idea" is one mode of the UserVoice widget; check out this document for details about using the various modes separately. The Post Idea widget allows your users to post ideas directly to your public forums. When they type in their idea and click "Next", they'll be prompted with matching ideas from your forums. If they find an existing idea that matches they'll have the option to become a supporter. Click the icon in the bottom left corner -> click "Widgets". Add the code to your website right before the final </body> tag (for more details on how to add the widget code to your site, check out this document. You have the option to specify a forum for the post idea widget. 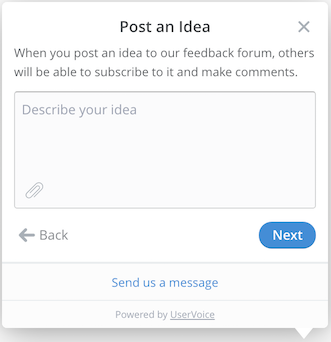 This will determine which relevant ideas are displayed in the instant answers feature, and also which forum that the user's idea will post to. If you do not specify a forum, the widget will use your default forum. To specify a forum, add the forum ID to the widget code as shown below. Please note: If you want to use the post idea widget with a private forum, you will need to use our token based single sign on and pass an SSO token in the widget. Learn more about this option here. Now that users can post ideas, you'll want a way to organize and update them. You can add a public status to your ideas, tag them with internal labels, and add supporters. If you want to keep new ideas private until they are approved by an admin, you can enable pre-moderation. Check out this document to learn more about the moderation feature.